Séance du 24 mars 1949 - Download this document for free, or read online. Document in PDF available to download. Séance du 24 mars 1949. 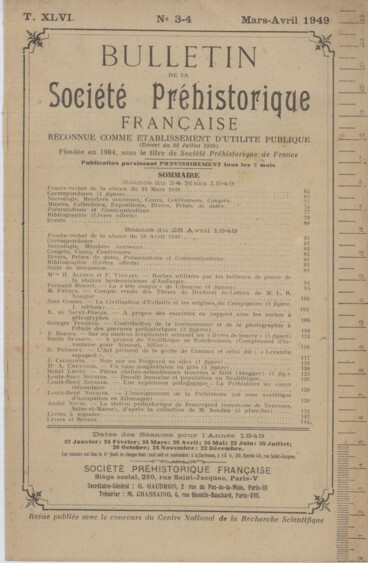 In: Bulletin de la Société préhistorique de France, tome 46, n°3-4, 1949. pp. 65-80. Two dimensional magnetic manipulation of microdroplets on a chip - Lehmann, Ulrike; Hadjidj, S.; Parashar, V.K. ; Gijs, M.A.M. On-chip non-invasive voltage clamp on Xenopus oocytes - Dahan, E.; Bize, V.; Lehnert, T.; Horisberger, J.D. ; Gijs, M.A.M. Pumping of mammalian cells with a nozzle-diffuser micropump - Yamahata, C.; Vandevyver, C.; Lacharme, F.; Izewska, P.; Vogel, H.; Freitag, R.; Gijs, M. A. M.